A Comfortable Cabin That's Perfect For Families And Outdoor Enthusiasts. 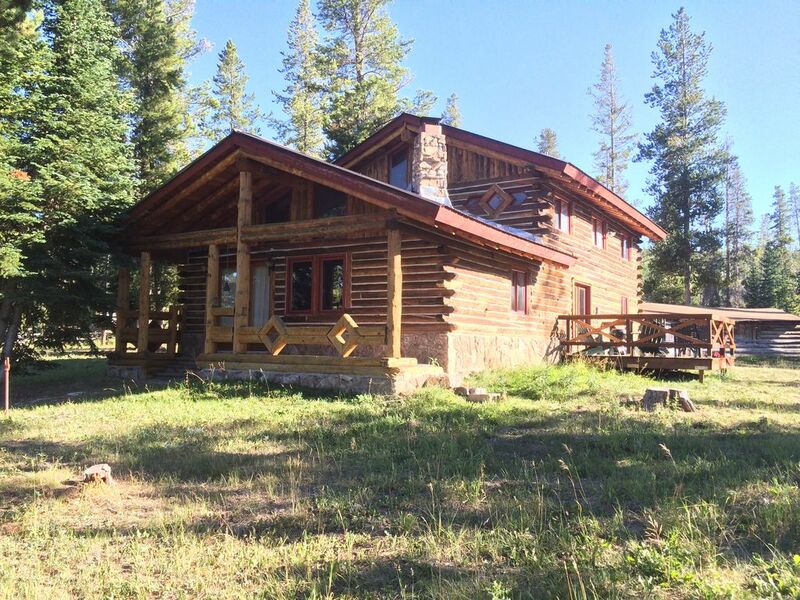 Surrounded by the Rocky Mountains, this home is perfect for a family vacation, hunting trip, or relaxing getaway. Located 45 minutes North of Steamboat Springs, this home-style cabin is an outdoor enthusiasts dream vacation spot. The property has private trail head access to the Routt National Forrest for your hiking and hunting desires. Even bring your horses, atv's, etc. to hit the trail as they are welcome to stay with you. When you stay here you will be just 18 minutes from Steamboat Lake State Park to the North and the Elk River to the South for all your water adventures. Hahn's Peak Roadhouse, The Glen Eden Resort, and Clark Store are all close by for your dining and food needs. Come stay and find complete tranquility as you connect with nature at your doorstep. The home is a time-share style rental with everything you would find in your own home. Upstairs: Master bedroom with queen bed and master bathroom. Large bedroom with two twin beds and pull-out futon. Small bedroom with a full bed. Downstairs: Living room, sitting room, dining room, kitchen, restroom and laundry room. Outside: Single, wood burning stove cabin with king size bed. Back porch with patio furniture and charcoal grill (charcoal not provided). Fire pit and picnic table. Fire place is available for use but wood is provided by the renter. Firewood is available for purchase with rental. Wood can be harvested from dead fall on the property if you bring your own tools. Single horse pen can be used to stall your equine friends. Pets are welcome upon additional cleaning fee. Like the majestic birds in which the road is named after, come see what is waiting for you at the end of Crane Lane. A Colorado Native, I live and work right here in Steamboat Springs and will be mostly available to you during your stay. We want to others to enjoy the beauty of our area by sharing our family cabin with you. The tranquility and peacefulness of the property location is beyond belief. Just come and find out for yourself. Property is located on a working cattle ranch! Views of Sand Mountain and Hahn's Peak. DirecTV in living room. DVD player in Master Bedroom. Large stereo in living room with aux cord. Private Pond and Steamboat Lake - Equipment not provided. Bike Trails are abundant - Bicycles not provided. Steamboat Lake Marina - Boats available for rental or bring your own. Table with umbrella, chairs, and 3 lounge chairs. Not only is the property wonderful but the owners are as well. My husband and I and our two dogs have ended our summer here for the past two years and hope to do it again next year. The property is clean and well maintained with all the comforts of home. Beautiful secluded location to unwind and enjoy the outdoors. See you in August 2019. Peaceful, beautiful, off the beaten path. Really cool place with all the basics plus some luxury touches ( dish TV). Perfect location to get away from the daily grind and get out into nature ( hike, bike, paddle ). My group stayed here and loved it. It is rustic and secluded but has everything you need for a nice stay. Zach, the property manager, is very accommodating and a genuine nice guy. We will be back! Very secluded and quiet. Get supplies before arriving. The cabin and surrounding area was beautiful and everything my husband and 2 dogs were looking for. Peaceful and quiet. You do need to drive about 45 min into Steamboat for supplies as the local stores have nothing much to offer. The only thing I would change would be to have internet service being everything requires directions and is accessed by web addresses. The owners were wonderful as well offering to provide any additional needs at the home. This was the best vacation we have ever taken. We will definitely return next year but for a longer period of time. Our family had a great stay at this secluded cabin, the owners met us and showed us around and made sure we had what was needed to enjoy our stay. Plenty of space, charcoal grill, and a nice big family table to enjoy our meals together. We made a couple of trips into Steamboat Springs about 30-40 minutes away and it was just a few miles to Steamboat Lake state park. We look forward to returning to this property again to do more exploring, bird watching and enjoying the the abundant wild flowers. If outdoors is your thing, then you are in the right place with Steamboat Lake State Park and the Routt National Forest in you backdoor. Hiking, biking, fishing, hunting, back-county skiing/boarding, snow shoeing, rock climbing, snowmobiling, boating, etc. the possibilities are endless. Check out The Hahn's Peak Roadhouse for your snowmobile rentals. Or visit Del's Triangle 3 Ranch for a guided horseback trip. Steamboat Lake Outfitters has your guided fishing and hunting trips. Individual rental agreement contract must be entered into by renter before key will be issued. A copy of this agreement will be issued at the time of check-in which will be determined at a later date.